The U.S. still lags behind much of the developed world in terms of the speed and density of its internet infrastructure. In the 21st Century this disparity in access to high speed internet could stand as a critical challenge to competitiveness in many areas, from industry and commerce, to healthcare and education, to civic life and culture. 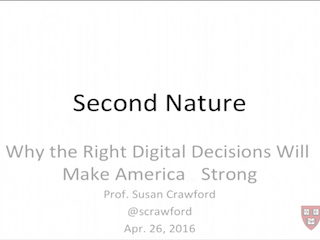 In this conversation, Susan Crawford — John A. Reilly Clinical Professor of Law at Harvard Law School and a co-director of the Berkman Center — discusses the potential futures we face as we consider how to invest in the wires that bring us our internet.